What began as a blogging platform nearly 15 years ago is one step closer to taking control of the entire web. 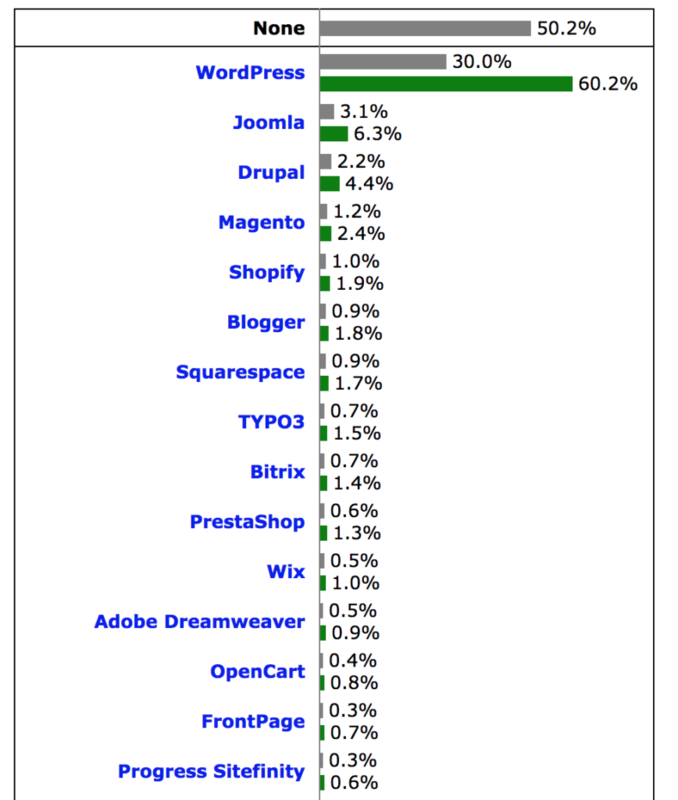 WordPress officially powers 30 percent of the web according to W3Techs. It is also the fastest growing CMS by far, with Squarespace and Wix barely coming close. These numbers are a huge victory for WordPress and the entire community. The CMS has outgrown its blogging roots and is now the most powerful CMS on the market. Not only does it power personal blogs, but it helps create digital experiences for enterprise companies. Let’s go over how we got here and where we are going. How Did WordPress Get Here? So what sets the CMS apart from the rest? The answer is simple, the community. Because WordPress is open source, anyone can create something to improve it. The support of every developer and volunteer to WordPress core is what has made the CMS as powerful as it is. Though there are still some people who believe WordPress is unsafe, that’s just not true. There is an entire team dedicated to making sure the CMS is secure. With the inclusion of HackerOne last year, people are rewarded for finding vulnerabilities. This has led to patches being found and fixed faster. Unlike many other CMSs, WordPress is incredibly easy to scale. You can turn your personal blog into an ecommerce powerhouse all on WordPress. This is one of the many reasons more and more enterprise companies are choosing it. Sites like TechCrunch, The New Yorker, and Macklemore.com all trust WordPress to manage incredibly high amounts of traffic. As we stated above, WordPress is open source. This means that anyone can build anything they need to make their website perfect. If you don’t feel comfortable coding your own tool, there are hundreds of thousands of plugins that can fix a problem you might have. Using these tools site owners can create whatever they want. Now the big question is how can WordPress conquer the remaining 70 percent? While WordPress is incredibly customizable, it can have a large barrier to entry. If you’re not a developer, it can be daunting to get started. Gutenberg could help to fix this. The content blocks are easy for people to understand. This could bring in users that were previously nervous about starting on WordPress. Another way to continue the reign of WordPress is to realize that it can support more than sites, it can support digital experiences. The CMS can create multiple ways to reach readers and customers. You can personalize each person’s visit, so they feel heard. You can gather data to better understand the kind of person coming to your site. You can include video, images, articles, and more all in one place. WordPress has the range to support all types and sizes of websites, which brings me to my next point. In the past, enterprise websites would often rely on proprietary custom solutions. Closed systems that make users dependent on their vendors and, as commercial products, also represent a financial commitment. However, if your goal was to build a site for your business, this was the way to go. WordPress, on the other hand, is historically seen as a blogging platform, tool for personal websites, small businesses, and entrepreneurs. Good for the masses, yet not suitable for Fortune 500 companies. Yet, that representation is no longer accurate. By now, WordPress has grown into a full-fledged CMS capable of powering websites of all kinds and sizes, including in the enterprise sector. Let’s go forward and conquer the remaining 70 percent of the web!